Acrylic Foam Tape (Acrylic Foam Tape) VHB Tape is a thick double-sided adhesive tape. The type of adhesive used is acrylic adhesive. There are many thicknesses (0.4mm. - 2.0mm.) And many sizes. Can be cut according to actual usage, the adhesive properties are high toughness, excellent adhesion strength Can be attached to many surfaces, many materials, suitable for glass, furniture, car exterior accessories such as rubber mounts, awnings, Aero Parts, Nameplates, Badges and Emblems etc. 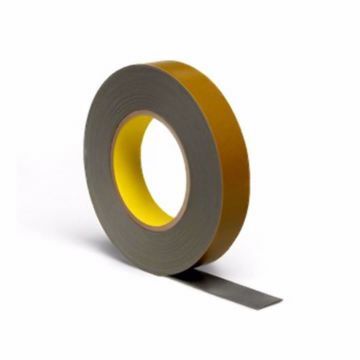 3M VHB Tape 4941F Gray is a conformable foam with a film liner and a multi-purpose, acrylic adhesive on both sides. It is used to bond high to medium surface energy substrates. It offers viscoelastic properties, durability, moisture and solvent resistance. V41 VHB Tape is an external tape Suitable for sticking plastic surfaces with oiliness. The thickness of the tape is 1.1 mm. V81 VHB Tape is an external use tape. Suitable for sticking plastic surfaces with oiliness. The thickness of the tape is 0.8 mm. Acrylic foam tape with a thickness of 1.1 mm, dark gray tape, suitable for Stick to the surface before painting and then bake to withstand high temperatures It is a fast, easy to use fastener that provides long-term strength and durability. 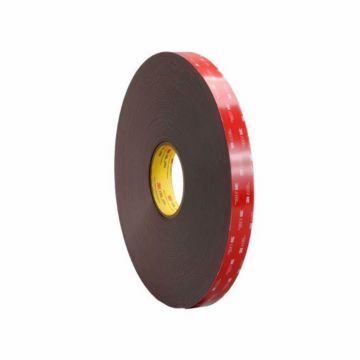 3M VHB Tape 5952 is a black, 0.045 in (1.1 mm), modified acrylic adhesive and very conformable acrylic foam core that bonds to a wide variety of substrates including low surface energy materials such as powder coated paints and plastics. 3M VHB 4920 is a 15 mil white acrylic firm foam tape with double coated acrylic adhesive. This product bonds to most high surface energy substrates including metal, glass, and high surface energy plastic substrates. 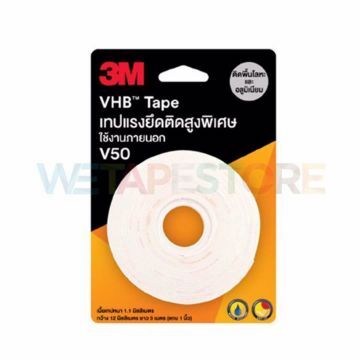 3M VHB Tape 4950. It is a white, 0.045 in (1.1 mm), general purpose acrylic adhesive with a firm foam core. It can replace rivets, welds and screws. The fast and easy to use permanent bonding method provides high strength and long-term durability. It offers design flexibility with its viscoelasticity and powerful ability to bond to a variety of surfaces. 3M VHB Y4930 It is a white, 0.025 in (0.6 mm), general purpose acrylic adhesive with a firm, foam core. It can replace rivets, welds and screws. The fast and easy to use permanent bonding method provides high strength and long-term durability. It offers design flexibility with its viscoelasticity and powerful ability to bond to a variety of surfaces. 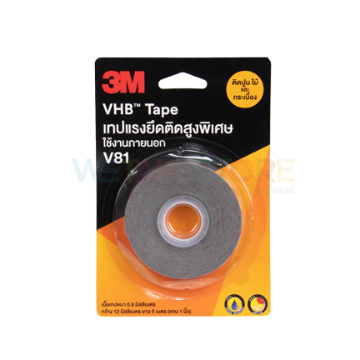 3M VHB RP16 Acrylic Foam Tape It is a gray, 0.016 mm (0.4 in), multi-purpose acrylic adhesive with a conformable foam core. It can replace rivets, welds and screws. The fast and easy to use permanent bonding method provides good strength and durability. It offers design flexibility with its viscoelasticity and can bond to a variety of surfaces even at lower temperatures. 3M VHB 5962. It is a black or white, 0.062 in (1.6 mm), modified acrylic adhesive with a very conformable, foam core. It can replace rivets, welds and screws. The fast and easy to use permanent bonding method provides high strength and long-term durability. It offers design flexibility with its viscoelasticity and powerful ability to bond a variety of surfaces. 3M VHB 4979F is a conformable, double-sided, pressure-sensitive, closed-cell acrylic foam tape with a PE film liner. 62 mil thick. 3M VHB RT8020 Acrylic Foam Tape 10 mm. 3M VHB RT8020 Acrylic Foam Tape 15 mm. 3M VHB RT8020 Acrylic Foam Tape 5 mm.